My carpentry experience has been obtained by working in the highly competitive west and southwest side Chicago land housing market for the past 30 years. This experience includes working as an apprentice, journeyman, lead man, roof cutter, and foreman. During these years the advancements in house framing technique and tools has been astounding. When I first started hardly anyone used an air gun, the framing square step off method was the normal way of laying out common rafters. There are still roof cutters out there that refuse to use any other method. Of course I don't mean build the roof first. You should be aware of where the rafters and ceiling joists are going to sit before framing the first floor. Place the floor joists directly under the rafters and studs on the joists, this will give you straight mechanical runs, and proper load bearing. Rough framing is hard work don't make it even worse by not making a plan and then following it. The first step in framing any residential structure is the laying of the sill plates and beams. Many carpenters get in a hurry during this process. You should take great care and get these located in the proper place. Squareness and proper dimensions will make the rest of the carpentry job go more efficient for you and everyone down the line, finish carpenter, flooring installer, and even the roofer's job will go better. I can't elaborate enough the importance of getting the building square! When framing the floor take note of any concentrated loads from above and if solid blocking is required. It is much easier to put it in before the floor is sheathed. Little carpentry tricks like this is what will make or break the bottom line! When framing walls, pay attention to where the beam pockets go and put them in while the wall is still laying on the deck as opposed to after it is stood up. Nine times out of ten if you put them in later there will be a stud nailed to the wall sheathing that will have to be removed costing you time. Whenever possible sheath exterior walls before standing. I always get a good laugh whenever I see carpenters slogging around in the mud trying to apply exterior sheathing. We won't even talk about the second floor! Learning how to build stairs is an excellent way to move up the ladder within a small or large construction company. Cutting stair stringers is similar to rafters. Framing of the ceiling joists and roof rafters go hand in hand. You must know where the rafters are to be located before placing ceiling joists. The use of a Construction Master Calculator increases speed and accuracy in all phases of rough framing carpentry. Changes usually come slowly in the rough framing world, however I'm a firm believer in implementing new tools and techniques as soon as it becomes apparent they will improve quality and efficiency. Keep an open mind, every once in a while the apprentice will come up with a good idea. You Must Learn From the Mistakes of Others, You Can't Possibly Live Long Enough to Make Them All on Your Own! You can't just jump out of the truck and start bending nails. My theory is to build from the roof down. Look at the roof plan and take note of any concentrated loads, varied wall heights, vaulted or cathedral ceilings, etc. A good rough framing carpenter knows these things before floor or wall framing begins. Information is added on a regular basis so check back often. 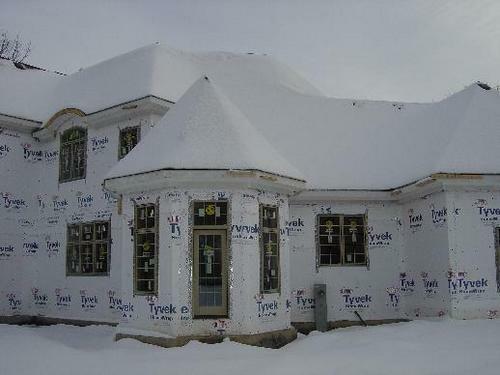 The same basic roof styles are used in any type of residential construction. Whether you are building a dog house, shed, garage, single family home, or mansion. Correct hip rafter length can easily be determined with the use of a Construction Master Calculator. When cutting hip rafters I prefer to cut them one at a time, because of the size and complexity, gang cutting is impossible. While the ridge board length on a gable roof is simple, a hip roof is only slightly more difficult. While it may seem intimidating pyramid roof framing is easy as long as you follow a few simple rules. Installing trusses on a shed, detached garage, or other small building is a good alternative if you don't know how to cut a roof. Even if custom wooden stairs are to be used portable stairs should be installed as soon as possible. Follow this advice on garage door framing and framing your garage door should be a snap. Floor framing requires careful planning starting with the sill plates and beams. Carpentry training courses are offered by many vocational schools as well local carpenters union training schools. Carpentry tips including house framing, roof framing, how to build stairs, carpentry tools,and related equipment. In residential construction several different types of concrete forms are used. 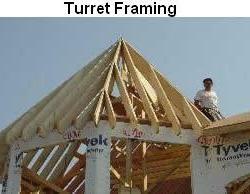 These are related sites to the house framing industry.